Aristokraft is a cabinet manufacturer that creates stylish wood cabinets for kitchens, bathrooms and just any other room that needs to be renovated in your home or office. 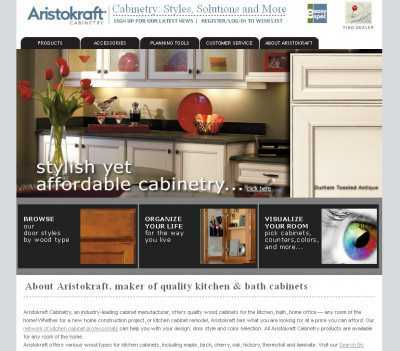 Its website can be found at www.aristokraft.com, and it gives you the option to browse through all the available cabinet models by wood type, by door profile and by room. And it also lets you customize the cabinet’s construction process, in the event none of the available cabinet types seems to suit your needs. Besides, the site includes an “Accessories” link where you can buy desks, hutches, bars and entertainment centers. And in case you need some help figuring out which cabinet would be ca better fit for your bathroom or kitchen, then check out the planning tools that are provided on this part of the site. These include an interface for visualizing your available room space, along with a gallery that shows the most suitable styles for each room in your house, and section where the latest trends are highlighted one by one. 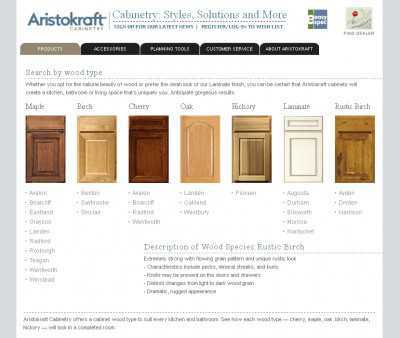 Aristokraft offers cabinets in all the following wood types: maple, birch, cherry, oak, hickory, thermofoil and laminate. 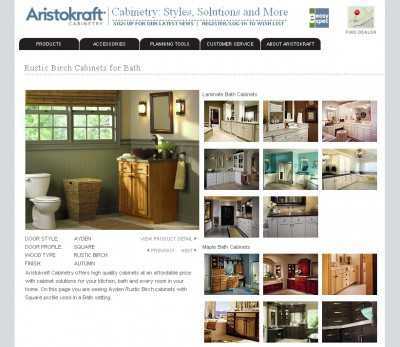 And all Aristokraft Cabinetry products are available in any color you want, too.